The Dollfie Dream community has been a lively buzz with Volks having announced Lucy Maria Misora from “To Heart 2” & Haruka from “Photokano” and the first shipments of Saber Extra & Saber Alter, however latest DD development includes some other news. Considering I had ordered Saber Alter 2nd ver, had ruled out any further purchases, but when I saw this Dollfie Dream a while ago I succumbed to her lovely smile. Couldn’t pass up on this opportunity so sinfully splurged even though it ended up being an auction purchase more expensive than had originally hoped. Once she arrived, was too tempting not to indulge in uploading this teaser photo. 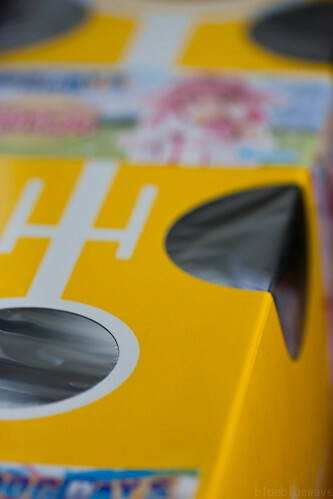 Actually started first with this deliberately misleading photo of a Volks Dollfie Dream box on Flickr. While some were able to make out it is the box packaging for Millhiore F Biscotti from “Dog Days”, actually did not purchase Millhi but only acquired her DDS body. So who is this new DD girl? Perhaps this last photo will enable you to make a guess? 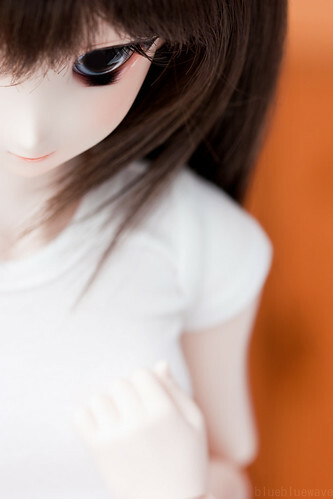 Rest assured, will properly introduce this new Dollfie Dream addition soon and have lots of photos for you. Curse you for deliberately giving us obscure angle shots, it’s not possible to make a sound judgement based on these pics! Thanks. She definitely has a great smile for being a more open mouth model. She is a very nice doll!